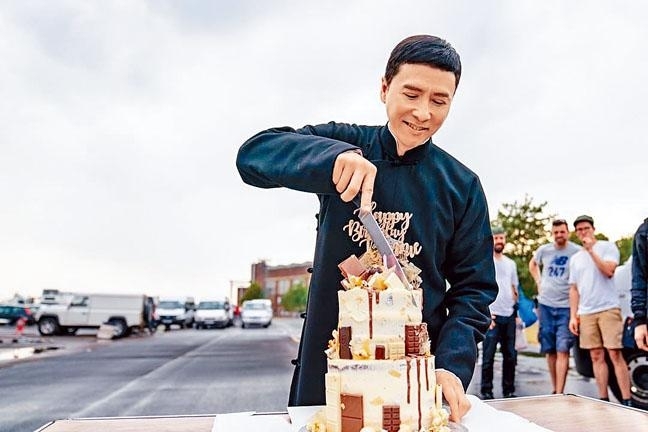 Busy with his new film IP MAN 4, Donnie Yen Chi Tan yesterday celebrated his 55th birthday. The team celebrated in advanced with him while shooting on location in England. He even posted the photos on social media and said that to be able to celebrate a birthday on the set was fate. He also remembered his wife and children as he hoped to be able to celebrate with them on the actual day. "Although I hope I will be able to spend tomorrow with wife Cissy and the children, today is IP MAN 4's final production day in England. Here it is only the 26th, but I still thank the team for celebrating my birthday in advance. Actually over the 36 years in show business, countless birthdays were on the set! All the seasons on the set is destiny between film and me, as well as the audience and me! I am grateful."